A new competitor will soon enter the electric mobile transportation market. WalkCar from Cocoa Motors promises the world's smallest electric car that can fit in a laptop bag. 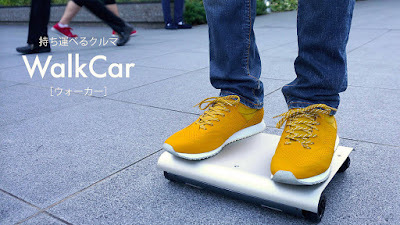 Similar to the latest 2 wheel scooters like the IO Hawk, Phunkeeduck, or other self balancing smart scooters the WalkCar is controlled by the users weight. The WalkCar has an aluminum shell and 4 wheels which makes it easier to stand on. Currently, the WalkCar is a prototype. Cocoa Motors plans to introduce a kickstarter on October 2015 to crowdfund a consumer release sometime in 2016. It is estimated to sell for around $800. Stay tuned for more information about their Kickstarter and future release.